DETROIT — Ford Motor Co. said its first-quarter earnings fell 39 percent from the same period a year ago to $989 million, as pricing across the industry weakened in the United States and warranty expenses for the company rose. Ford reduced its European losses in the quarter by more than half, the company said in a statement today. Profit margins in North America declined 35 percent, due to higher incentives and a $400 million increase in warranty reserves related to previously announced recalls and other service campaigns involving vehicles from past model years. Ford did not specify which models or recalls resulted in the added costs. Ford said “weather-related costs” cut North American earnings by about $100 million. "We had a solid quarter, and we are on track with our most aggressive product-launch schedule in our history," CEO Alan Mulally said. It was Ford’s 19th consecutive profitable quarter. Ford’s pretax operating profit dropped 36 percent to $1.4 billion. After taxes, its operating profit was equal to 25 cents a share, down from 41 cents a year ago and below the 31 cents that Wall Street had projected. In North America, Ford earned $1.5 billion before taxes, down from $2.4 billion a year ago. Revenue in North America declined 5 percent to $20.4 billion, and margins for the region were 7.3 percent, compared to 11.1 percent in the same period of 2013. Ford reduced its European pretax losses in the quarter by more than half, to $194 million from $425 million a year earlier. Ford cited higher sales volumes, lower costs and favorable currency rates. The automaker’s sales in Europe jumped 14 percent last month as industrywide deliveries rose for the seventh consecutive month. Ford remains on track to be profitable in Europe in 2015, helped by its own cost-savings actions as well as a rising European auto market, Chief Financial Officer Bob Shanks said. He said Ford has raised its outlook for four-year auto sales in 20 Western European markets to 14 million to 15 million, from 13.5 million to 14.5 million. In its Asia-Pacific region, Ford swung to a record pretax profit of $291 million from a loss of $28 million a year earlier. The profit was more than double the previous quarterly record. Market share in China rose 0.9 point to 4.5 percent, also a record for the company. In South America, Ford’s pretax loss widened to $510 million from $218 million a year earlier. Much of that was due to the effect of unfavorable currency shifts on the company’s balance sheet. Ford’s first-quarter automotive cash flow increased 71 percent from a year earlier to $1.2 billion. The company ended the quarter with automotive gross cash of $25.2 billion, up $1 billion, which exceeded debt by $9.5 billion Revenue rose less than 1 percent to $35.9 billion. Ford warned in December that profits would decline in 2014, which it described as a transitional year amid the rollout of numerous redesigned vehicles. New versions of the Ford Mustang and its most lucrative nameplate, the F-150, will arrive at dealerships later in the year. The company is bringing out 23 vehicles this year, more than double the 11 it introduced in 2013. Executives have said the benefit of those products will not show up until Ford’s 2015 results. In addition, Ford is preparing for a leadership transition, with COO Mark Fields expected to replace Mulally before the end of this year. Ford has not formally announced its succession plan for Mulally, who has held the automaker’s top job since September 2006, and it did not discuss the matter in today’s earnings announcement. Fitch Ratings said in a report this week that it is encouraged by Ford’s progress in Europe, declining debt, reduced pension obligations and improved products. 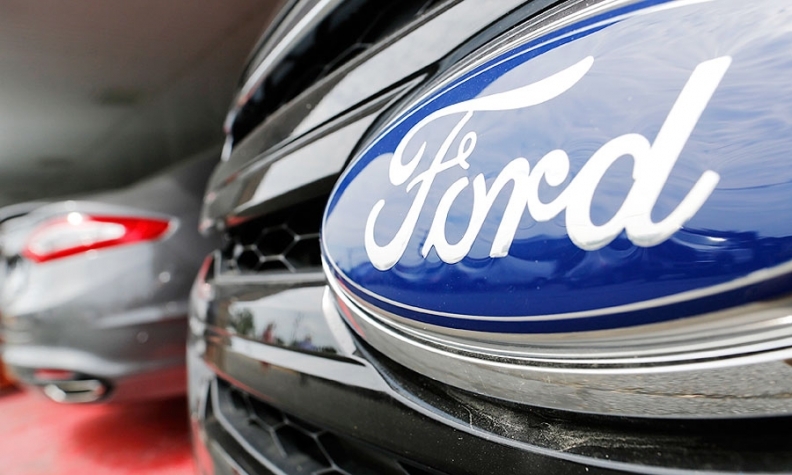 Fitch said Ford now has enough liquidity to avoid “falling into financial distress” if the market enters another severe downturn in the future. “Overall, Ford's increasingly competitive product portfolio and lower cost structure have positioned the company to withstand the significant cyclical and secular pressures faced by the global auto industry,” Fitch said in a lengthy statement upgrading its outlook for Ford to positive from stable. Ford’s earnings results come a day after General Motors reported much weaker first-quarter income. Costs associated with GM’s recalls of 7 million vehicles this year cut the company’s profits by 86 percent in the quarter, to $125 million. Chrysler Group plans to report its first-quarter earnings May 6.